As the influential ancient capital cities in China, Beijing and Xian have lots of things worthy of exploring for various tourists. That is an excellent choice for history lovers. The 4 days Beijing & Xian tour covers most highlight attractions in the two cities. 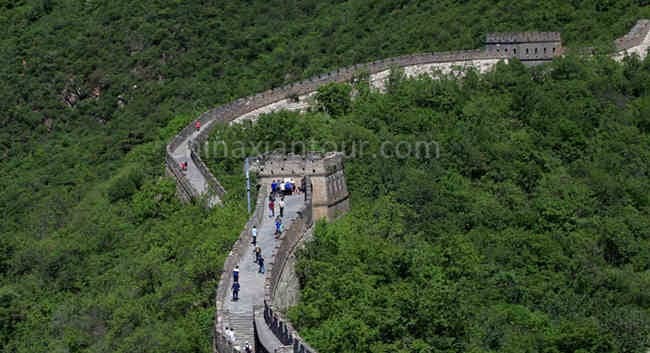 Upon your arrival in the morning, our guide and driver will pick you at train station or airport and begin the trip to the famous world’s heritage, the Mutianyu Great Wall which enjoys the best scenery among all Great Wall sections in Beijing. If you want to reach the highest point, your guide will help you to buy the cable car tickets on spot (Cost for cable car on your own). After lunch we will pay a visit to Dingling Tomb, the mausoleum of the 13th emperor of the Ming Dynasty (1368-1688). Our guide and driver will pick you up from hotel in the morning. Then you will visit the famous Tiananmen Square and the Forbidden City. 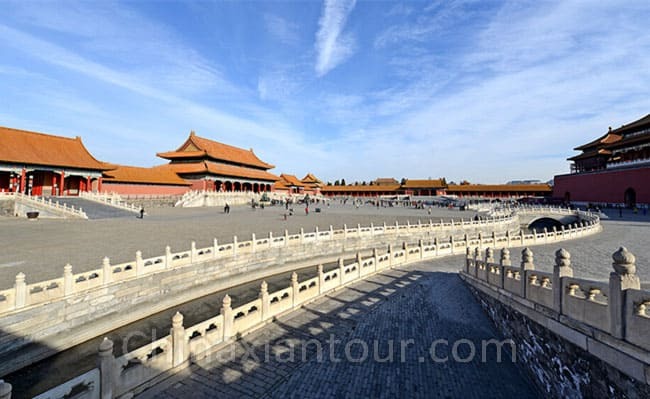 After a short sightseeing at Tiananmen Square, you will walk across the Golden Water Bridge and come to the splendid Forbidden City built 600 years ago, where you will be impressed by the gorgeous imperial palaces and vast storage of historical relics. 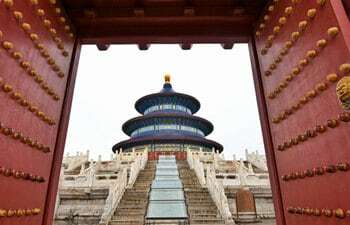 After the lunch, visit the Temple of Heaven in the afternoon. It’s a royal temple in the Qing Dynasty (1616-1912). 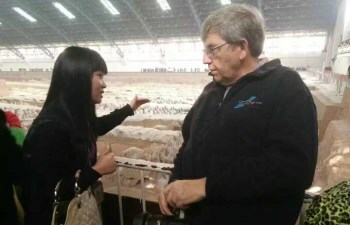 Then transfer to airport for late evening flight to Xian. 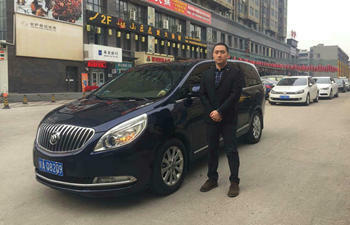 Arrival in Xian met by local driver and you will be escorted to hotel in city center. Our guide will pick you up from your hotel in the morning. First you will visit the Banpo Museum. This New Stone Age site, dating from approximately 5,000 to 4,000 B.C., is one of the most complete examples of a Neolithic agricultural settlement in the world. Then move to the Terra-cotta Warriors and Horses. It was praised as “the eighth major miracle of the world” including Vault 1, 2 ,3 with the total area of 22,780 square meters. It shows a surprisingly high level in sculpture and it is the most significant archaeological excavations of the 20th century. Lastly we come to Big Wild Goose Pagoda which was originally built to hold sutras and figurines of the Buddha that Xuanzang brought back to China from India. 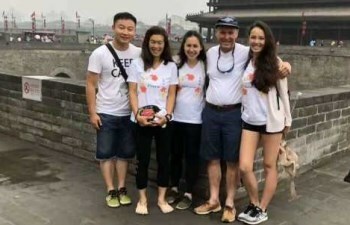 After hotel pickup by guide and driver we will move on to visit Xian Ancient City Wall, the most complete city wall that has survived in China. It is one of the largest and most complete ancient military systems of defense in the world, the largest and most intact City Wall of the Ming Dynasty. 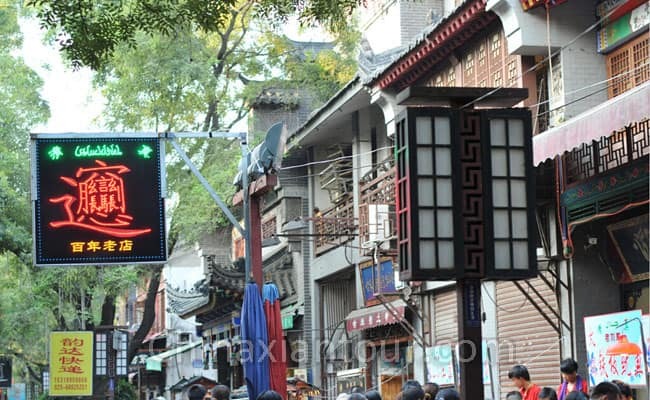 Then take a walk in Muslim Quarter, the most famous food street in Xian. In the street there are lots of local snacks as well as many little tourist souvenirs. 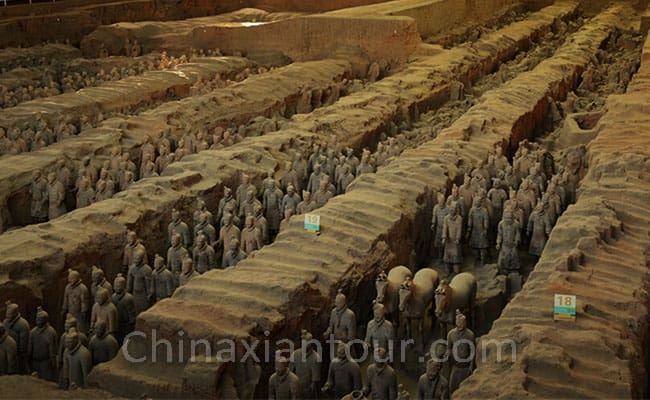 After lunch we will head to airport, on the way you will make a stop to visit Hanyangling Museum which is the tomb of the fourth emperor Jingdi in the West Han Dynasty (202BC-8AD). Then drive to airport and take the flight to next destination. Please send your travel request via e-mail sales@chinaxiantour.com to us. 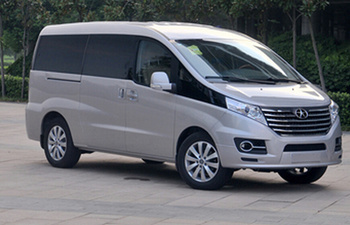 You are also welcome to call us at 0086-15129005119 from Mon to Sun 24 hours. Our real trip advisors will have your booking confirmed no more than 1 working day. We even take last minute booking if time is pressing. When your booking is confirmed, you will get a confirmation email from us, which includes the confirmed detailed itinerary with prices. A small amount of deposit will be charged in advance via paypal for tour booking (Deposit for tours excluding train/flight/hotel: USD50-USD100; Deposit for tours including train/flight: your travel consultant will advise according to group size and itinerary). The balance can be paid to our tour guide when you are on the tour, or the credit card balance payment via Paypal latest 3 days ahead of the tour date. Both RMB and hard currency are acceptable. Over 15 years, we had built up a professional guide team. They are 100% guaranteed licensed guide. Apart from been knowledgeable, they are also friendly, fun, attentive, and flexible. Nothing is too difficult or troublesome for them, as they will always try their best to make a pleasant journey for you! 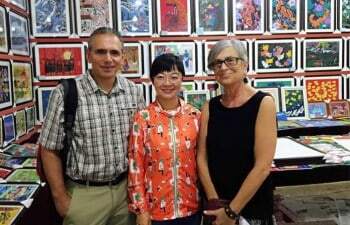 You may get new friend after travelling in China! Always makes you feel safe and comfortable is the main goal of our service. 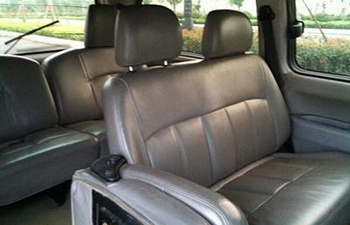 The vehicles we use are all air-conditioned and kept in good safety and sanitary condition. The drivers we use are all licensed driver with many years driving experience. More attentive, we offer you a free baby seatservice if you travel with your baby. 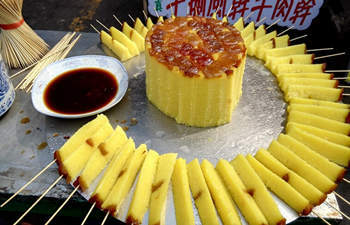 Food is a part of the important culture for Chinese people. China fits for all budgets. Hotels booked by us will include breakfast. 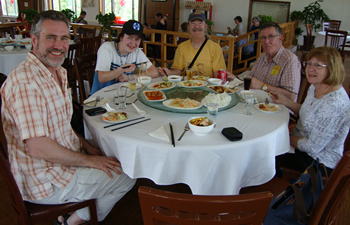 Lunch is chosen at restaurant which is popular among locals, and with good environment. (All restaurants have Western styled Washroom available if this is what makes you feel headache about China) Dinner is mostly left for yourself, so you enjoy more freedom on your local food adventure or some familiar hometown food. 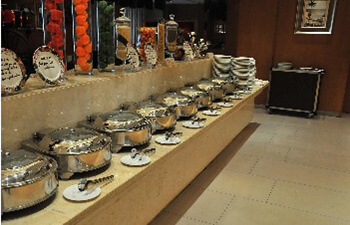 If you are a Vegetarian, or Muslim , or allergy on any kind of food, you are suggested to inform this to your travel consultant, they will help arrange proper restaurant or food to meet your needs. 2002-2019 © All Rights Reserved.